The Journey. | "Not Now, Honey. Mommy Has to Blog." "Not Now, Honey. Mommy Has to Blog." Because life is too cool not to share. These meetings are fairly routine with both parties discussing any issues in care that come up. For example, a favorite plaid shirt that may have gone missing in the laundry; or arranging for him to have an extra blanket for nighttime. Last week was meeting day. As my mom and I walked into the meeting room and made ourselves comfortable, the social worker, MaryAnn, and Karen the charge nurse sat opposite us as we exchanged early morning pleasantries. Staff have become extended family, as my dad enters his 7th year at The Inn. We often have our share of laughs at these meetings, as we continue to find the funny moments that can be a part of his day. But early on this morning, I could sense something else was on their mind other than the usual agenda of this-and-that. My mom and I nodded in agreement. This wasn’t news to us, after all. The last month, in particular, my dad has become increasingly lost inside himself; weaker physically; and often refusing to eat lunch, or sometimes dinner. I looked over at my mom, who continued to nod, and then back at MaryAnn and Karen. Then I felt an unfamiliar pang in my chest. It slowly started to hit me what they were saying. “You mean…are you saying… it’s time to look at hospice?” I asked. They both nodded, as I felt like a bullet hit me between the eyes. Hospice? Really? Are we really at that point? They went on to reassure us that hospice is often surrounded in misunderstanding. That really it’s often another “layer” of care, but specifically focused on my dad. He’ll still stay at The Inn. He’ll still receive the care from staff. But an additional team will now come in – often several times a week – and make sure my dad is comfortable, perhaps play him some favorite music; assist him in any way he needs them; keep him company. Additionally, they can encourage him to eat and will be looking at all his medications to see what can be discontinued, and no longer adding value. “I’m sure he would love the extra attention!” I suddenly heard my mom say from next to me. I looked over at her as she sat in her chair, her poker face on, bravely and cheerfully accepting what they were telling us. I silently wondered how that must feel, to be told your husband of 62 years is entering into this new phase. She is the strongest woman I have ever known. 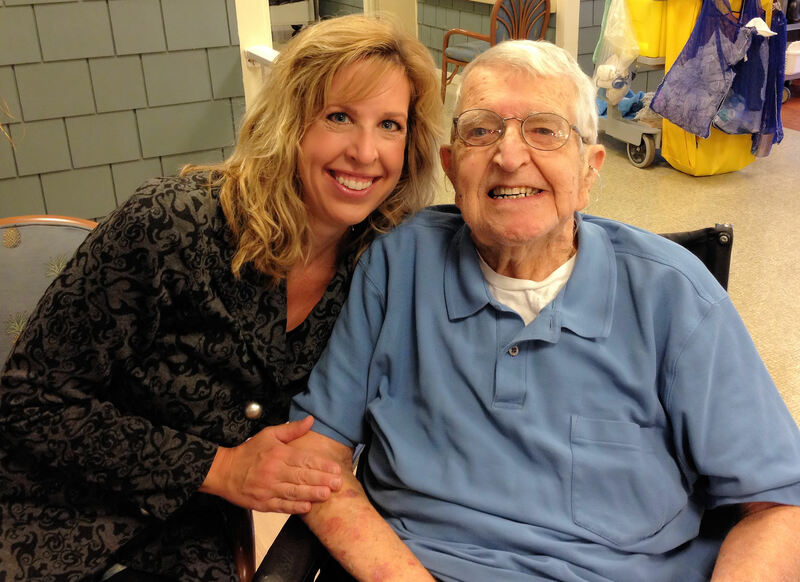 The more we talked, we learned that hospice is not necessarily a death-sentence; rather it can be a “blessing in disguise” to provide more focused care specifically for my dad. They will look at his activities. They will keep him company. They will give him his meds when needed. I was surprised to learn that some people even get discharged from hospice, if they gain weight; or make other small improvements. It’s just more focalized care. Staff at The Inn are in charge of many patients. Hospice will only focus on my dad. Our meeting finished up and we went to see my dad. He was having a good day – smiling, eating his breakfast. He recognized us right off the bat and brightened up immediately. My dad smiled and took my hand. “Thank you, darling,” he said. Yesterday, my mom and I met with the hospice nurse who came to assess my dad. She will be his “plus-one” going forward. She was lovely. She sat us down and asked us all about his health history which she dutifully tapped into her laptop, and then a few minutes later, we were joined by her colleague, a social worker, who questioned us about his religious preferences and other things. Suddenly, and quite out of the blue, it became very important to me that these people learn every possible detail about my dad. About his 7 children who he and my mom raised; how he was in sales all his life – once winning a prestigious national sales award. We discussed how he was a devout Catholic, never missing mass and how proud he was that his older brother, in his 90’s is a retired Catholic priest. We talked about his beloved Notre Dame and how growing up, watching a Notre Dame game was a “religious experience” on the Saturdays of my youth. We talked about how his family has rallied around him and that many of my siblings – even those who live in the Midwest – have come out to see him as often as they can. I wanted them to know my dad. He’s not just a patient. He’s not just a number on a chart. They asked us if we are plugged into any support groups. Like Alzheimer’s support groups or anything like that for family members. I was surprised by the question. These hospice people actually were asking about us. Kinda cool. The hospice meeting began to wrap up with my mom and I feeling much more encouraged and grateful that this layer of care existed for people and their families. It felt like we won the lottery! This was going to be a good thing! And, as they said, people can often be on hospice for a year or more…with some even getting discharged if they do better! As we prepared to leave, they asked if we had any last questions. One suddenly crossed my mind, but I wasn’t sure if it was appropriate to ask or not, but what the heck. “You mean like being on a train?” I whispered. “My dad’s been talking about being on a train a lot – like on a dining car.” I explained. A lump formed in my throat. My face started to get hot. I shifted in my chair and smiled at a staff member walking by to try to distract myself. I tried to focus on the women’s faces, but suddenly they became blurry. They were looking at my mother who was bravely taking all this information in. Too late. My eyes welled. The ladies stopped talking. They looked at me with concern and understanding. It’s not like they haven’t seen it before, right? The nurse started to get up and find a tissue. My mom looked over at me and her eyes flashed open. Immediately she took my hand. “Oh, honey,” she said. My eyes gradually dried as I took this in. The more I thought about it, I realized how important it was to hear this. For once, someone was empowering our family with the tools to help my dad on his journey. It’s okay to talk to him in a way that is reassuring to him; that provides a sense of peace. I suddenly had a very strong feeling that these women would be our “guardian angels”as we navigate this road. I composed myself after a minute and glanced at the clock. “Mom, I have to get the girls off the bus, I’m sorry…I gotta go,” I whispered. I was her ride home so she stood up to leave. We thanked the ladies profusely and explained that for the first time in a long time, we were feeling like we are heading in a positive direction. That we are feeling a sense of control in an out-of-control time. As my mom and I rode home, I didn’t want to talk. In just 15 minutes, my two little girls would be getting off the bus with playground-stained clothing and toothless grins racing up the driveway to tell me all about their day. For now, I have to compartmentalize what I’m going through with my dad. Until I can better process how to think about it, I have a 5 and 7 year-old who are dancing through their childhood with complete joy and abandon. And they need me. As the bus pulled away and I watched my little girls throw their backpacks to the ground and race off, it hit me that there’s so much “life” that surrounds me. Life in so many stages. My dad is in the Winter of his life…my babies are basking in Springtime. Each stage is a gift. I’m blessed to experience it all. I’m so sorry, Teresa. This is a new and very much unwanted leg of the journey, and you all have my prayers as you move ahead. It’s interesting; my 95-year old grandmother is on her deathbed in WI, and she’s wanting to see her mother. (In fact, my dad said it seems that she can see her already…) As you said, for everything there is a season. And what a blessing that your dad loves God, for you know that he’ll be with Him for all eternity, made whole again, with no more confusion or suffering. He’s hoped for this all of his life, and although he surely doesn’t want to leave all of you, he will then be able to be with you constantly in spirit, praying for you and cheering you on, as you pick up that brightly burning torch of life that he lit, and carry it on for him … just as he taught you, bringing laughter and joy to others. And … in case you don’t know it … *you* are beautiful! Teresa I really love what you are doing writing about your dad like this it is wonderful. I lost my father eight years ago and I remember it everyday I had no real time to soak it in it was somewhat fast we had to take him off life support my goodbyes were quite differant. I am so happy that he is going to have special care and extra attention and that you and your family get to be with him and have these memories which in some ways I hope make this whole journey a lot easier on Ed as well as you and your family. Remember I am always here if you or your family need anything, I have grown to love your dad over the last five years and am happy to have been a small part in his and your families lives, God bless.